This is part two of a two-part episode in which we explore how the University of the Ozarks, a small, private, liberal arts university in rural Arkansas, has managed to consistently grow enrollment despite the challenges facing small private schools. 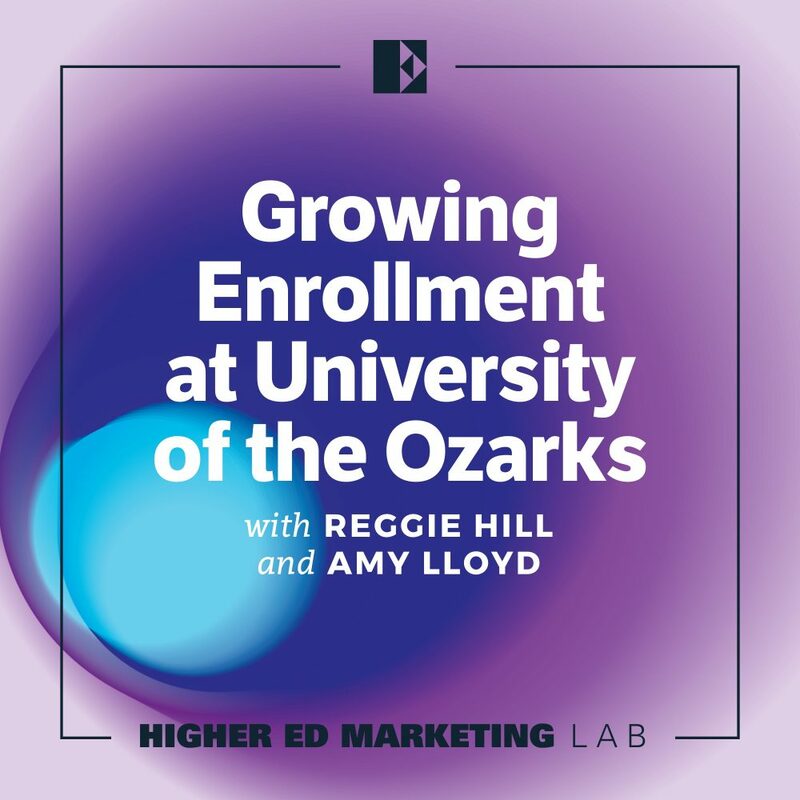 In this episode, Reggie Hill, Vice President of Marketing and enrollment at the University of the Ozarks and Amy Lloyd, Ozarks’ Director of Marketing, continue to dig into the key factors that have allowed their institution to thrive; and in one case, generate a 30 percent year-over-year increase in enrollment. We hear what Amy learned when she started attending recruitment events, and how Ozarks has focused the recruitment and marketing activities for maximum impact, which included foregoing a traditional view book and replacing it with something else designed to generate even more impact. We wrap up by hearing how Amy and Reggie, productively, approach internal resistance to new ideas and how they focused on the long game. This was an incredible conversation that, I hope, will both inspire and challenge you as you think about your own marketing and enrollment efforts. You’re listening to Higher Ed Marketing Lab. I’m your host, Jarrett Smith. Welcome to the Higher Ed Marketing Lab, I’m Jarrett Smith. Each episode, it’s my job to engage with some of the brightest minds in higher ed in the broader world of marketing to find actionable insights you can use to level up your school’s marketing and enrollment efforts. This is part two of a two part episode in which we explore how the University of the Ozarks, a small, private, liberal arts university in rural Arkansas, has managed to consistently grow enrollment despite the challenges facing small private schools. If you haven’t already listened to part one yet, I encourage you to start there. Not only will you get some important context for our discussion, but you’ll also walk away with some fantastic insights. In part two, Reggie Hill, Vice President of Marketing and enrollment at the University of the Ozarks and Amy Lloyd, Ozarks’ Director of Marketing, continue to dig into the key factors that have allowed their institution to thrive; and in one case, generate a 30 percent year-over-year increase in enrollment. We hear what Amy learned when she started attending recruitment events, and how Ozarks has focused the recruitment and marketing activities for maximum impact. By the way, this included foregoing a traditional view book and replacing it with something else designed to generate even more impact. We wrap up by hearing how Amy and Reggie, productively, approach internal resistance to new ideas and how they focused on the long game. This was an incredible conversation that, I hope, will both inspire and challenge you as you think about your own marketing and enrollment efforts. So enough for me, let’s jump into part two of my conversation with Reggie Hill and Amy Lloyd. You asked the question is, “How do you remain relevant?” What we do is we synthesize the connection between enrollment and marketing. So for example, Amy says, “I want to recruit.” Why does she want to recruit? Because she wants to understand the experience of the admission counselors, right? So how could you build a marketing strategy if you don’t know what the experience is like for the person who’s actually enrolling the students? The Vice President of Enrollment actually still recruits and has a territory, because I want to know the experience of the admissions team and what they may go through. The President still is involved in enrollment because, again, going from a small liberal arts university and trying to build scale, and trying to grow at a rapid pace, all stakeholders of the university has to be involved in enrollment management. How can this be better? And it looked great but if we, as marketing, if me and my team and the two awesome designers that we have would have set the table up and said, “When the counselors go, this is how the table is going to look.” So if they put the travel piece on the purple tablecloth and it comes full circle, it would be cool if it was this like against the purple, and it’s going to catch someone’s walking by. But, no, and so I’m like, or you see them walk in, and it’s from the beginning of you see them walk in, and who knows about Ozarks and you don’t. You know when their eye hits that in that split second, if they recognize who you are and what you stand for, or if they do not. I haven’t been the same since, and I went back and I’m like, “Ladies listen.” To our designers, I’m like, “This is a bigger picture, we need to be a part of this.” And so I don’t think, one that I would have respected the hustle that they have in everything they do near as much. And two, I’m invested in that table now, I’m invested in making it better. Or even in the high school visit experience. Attending high school visit experiences and giving presentations to classrooms, and you know what visual aids should look like. And how can it be consistent, right? Consistency and being coherent is very important. Every presentation should look and feel the same, and you should communicate the same message no matter if you’re in Northwest Arkansas, Southern Arkansas, Central Arkansas. And sometimes when we send admission counselors off into those regions, the message is different. And that’s powerful. So we go to one area, and it’s all about out of state, and we’re competing with out of state, which I do not realize. Because it’s not very far down the road versus another school, it’s a local, and it’s a local market and how do we appeal to local? How does that change the creative? How does my message go to what they’re terming as ‘Shop local’? That local, this is what it can do for you, hometown, love, feel good. To now I’m competing with out of state and it’s saying … Or I’m competing with regionals. And they know, “Okay I’m going to come back home. And I’m surrounded by these large companies that are international, and so if I go to Ozarks and I get to travel, and I get to experience these things, I’m going to be better prepared to come back here.” They’re all within probably 200 miles of each other, and those messages are dramatically different; and I never understood that until I went here, and I heard somebody give the same pitch that we gave 50 miles down the road and the response and the reaction was very different. And It’s also I learned it was exhausting. But the heart that they have for students that’s, again, what makes Ozarks special. And it just makes you have a greater respect for colleagues, which I think, then, challenges you to work harder as well. And we spent a lot of time developing a relationship with those stakeholders in those regions. That is probably one of the most important things that a university leadership and, especially, enrolling marketing leadership can do; we think about the things that are more visible. But the thing that is invisible, and no one wants to talk about, is those relationships and the continuity of those relationships; that can yield dividends for universities as it relates to enrollment. Yeah. There’s so many interesting sort of themes that I hear from y’all, and I hear from other folks in the industry too, as I think as we kind of grapple with this kind of crazy new world where marketing tactics have a very short shelf life, and it really pays to understand precisely who your customer is. One of them is, it reminds me of and old saying that “No good marketing happens behind a desk.” Which is exactly what you’re talking about. It’s about getting out, interfacing with folks, really hearing firsthand what they’re saying and the non-verbals, and how they’re feeling and seeing that how they’re responding to your messages in real time. The other piece, the other kind of theme that I hear over and over again is this idea of what some people refer to as the ‘T-shaped professional’. So it’s like you’ve got all these different disciplines and you, as a professional, kind of take a deep dive on one of those. You understand marketing, you understand recruitment; whatever it is, and that’s kind of the vertical part of your ‘T’. But unless you have that sort of top part of the ‘T’, that can span across the disciplines and really understand what someone else’s reality is, then the thicker that top part of the ‘T’ gets, the better off the organization is. And it sounds like, at Ozarks, you’ve really done a good job of cross pollinating that information, and helping people really understand the reality of what’s going on. And those are your ancillary relationships, right? Whether it’s with Echo Delta, whether it’s with a film company that we work with, Indie Atlantic, or whether it’s with, again, those stakeholders in those regions, whether it’s international or domestic, those partnerships are vital to the survival of the university. And I think we talk a lot about admissions and enrollment, but in higher ed, more generically what does it look like for advancement and alumni? So if you translate completely across the other spectrum of the revenue generating side of the institution, it’s how does what we’re doing with admissions and these students, translate to once they graduate and they’re alums, which these heat maps that we have of where we recruit, then because heat maps of where our alumni are, which they’re our brand reps, without us having to be brand reps, which has a synergy, which they donate, which they come to homecoming, which there’s this positive, organic buzz that is invaluable. You cannot pay any amount of money to get that work, uniquely, and it’s more powerful than any paid social spot we can do. And let’s kind of peel that back, because continuity is important. When we first came to Ozarks, we brought up a heat map of our name by or our marketing strategy. And, essentially, what we saw is there was no rhyme and reason behind why we did what we did. But when you reverse engineered where the students came from, where they graduated, Ozarks and where they went back to, they were in smaller geographic locations; but the university totally missed the mark. Year-over-year, and we’re seeing positive enrollment trends, 7 to 10 percent, each year. And I think that goes back to the same two words that we had when we started this, when we started talking about brand and authenticity is, ‘Own it’; so we’re owning those markets. Okay, there may be one student that doesn’t live there that somebody’s saying, “Why haven’t you visited this school or this?” And it’s okay, we own it, we own our markets, or we do our best to own those markets. And so I think that’s, again, being transparent. We’ve started saying, just kind of internally between our teams, now we’re at a point where we’re just going to say “This is Ozarks.” And that’s it. This is powerful, it is there are flaws like anywhere, there are great things, and this is Ozarks, and we own that. And I think it translates from enrollment, it translates from branding, it translates from leadership. Again, it’s not easy to own it, it’s the foundation. And sometimes we get caught up in the whole notion of tradition, right? And tradition, tradition, tradition and we want to go back to those traditions, but the mission is is to move forward, and understand the changing demographics, the changing socioeconomic side of the state and the region, and be able to apply a sound strategy towards those changing, moving demographics. So speaking of traditions, you guys did away with one of the traditional marketing pieces, a view book. You’re a school that operates without a view book? What is it view book? Magazine, right? You have to answer your question, we’re talking about student behavior, right? What a 16, 17, 18 year old reads magazines now? And so if you’re layering it, that same concept, you’re just wasting hundreds of thousands of dollars on paper, that no one ever consumes. Simple. We talk about TV, lot of universities are moving to advertising on TV; and millennials and Gen Z are cable cutters. And they’re all streaming platforms. So, if you’re on radio and they’re all streaming platforms, you’re missing your target audience. Yeah, just one thing [inaudible 00:13:53] noted. Everybody’s playing crash card again on [inaudible 00:13:57]. But that’s twofold. Because, no, they’re not on those platforms; however, that same content in video form is the most valuable. It’s the most consumed. So it’s the same content, and now we’re seeing audio [inaudible 00:14:15] we’re on podcast, podcasts are popular, streaming platforms are popular. And so we’re seeing that video and audio still remain the top dogs, but where they are is what’s changing. And so it’s not just say that we don’t value commercial, we value video content, but we shoot our video content for social. Shoot to make this work. But I think everybody’s still shooting commercials, no matter where you’re placing it. So shooting the standard commercial. Oh, absolutely. That is truth, and yeah, how do you place products within audio like podcasts? Anybody listening to this, “Do you have a son or daughter, apply to the University of Ozarks at www.Ozarks.edu/apply. We need a [inaudible 00:15:05] link, so I can get the credits from this. And figure out where your audiences are placed in this position. So we’re [inaudible 00:15:25] that. We keep shifting, right? This admit box and which I think is … I don’t want to say revolutionary in terms of a concept or how we deliver a celebration to our prospective students or our accepted students. It takes on a new form. And just like you said, “Okay we’re ditching the view book, but we’re not walking away from print, and physical, tangible items all together, we’re just going to invest in something else.” And that observation of, “It’s not the mailbox, it’s the doorstep.” It’s maybe 30 feet away, but it is a completely different experience. Could you talk a little bit about that? Because you’ve made some significant investment there. Completely for us, but we went from 17 different little tchotchkes that we handed out when you came along the way, and they all went away, and we invested in one big piece. Yeah, this is interesting. Everybody knows this, we give 10s of thousands of dollars away of these things, whether it’s key chains, whether it’s lanyards, whether it’s stickers, yeah; whatever else at open houses and at acceptance Tuesday. And we all know it ends up in the garbage can right outside the campus, and so but we continue to invest. And so we had this ‘Aha moment’ about the ‘Admit concept’ or the ‘Admit experience’. And it really came from two frames, it came from social media and subscription boxes, whether it’s Birchbox, whether it’s BarkBox, whether it’s Truck Club; and then, Amazon. Yep, and so we wanted to do something that was relevant to them and their experience. What 16, 17, 18 year old doesn’t like when their Amazon box hit’s their doorstep? Oh yeah, it’s like a little mini Christmas. Yeah, absolutely. And understanding that you can really customize their experience and deliver it to their doorstep was transformational for … Not only higher ed, but also for University of the Ozarks. And there’s a lot more thought that went into that. And that’s where authenticity meets being relevant. And you want to talk about the Admit concept? Yes. One thing that Reggie mentioned, two big inspirational pieces being subscription boxes in that trend, and then Amazon’s rise. And so that’s important in the sense of, we need to point out that that is not higher ed. So this concept came from something that was very industry and corporate and very not higher ed. And that’s a shift, that a shift when we get to be different and we get to be in a space that maybe other institutions aren’t yet. And so it’s getting on social media and seeing BarkBox, buying into that whole thing of, “Okay, if that’s what’s trending, why couldn’t we do that?” I mean, why couldn’t we deliver something like that? Again, it’s a risk, it was a risk, it was very unconventional. And the biggest resistance you might get is internally, right? It was, “Heres a buff.” Maybe you’re coming here as an athlete, and you can wear this at practice for sweat. Maybe you’re going to come here and you’re going to hike all the time, and it’s something you put over your face or you use it as a cooling rag or something like that. So it was really taking four pieces that they could see themselves using it Ozarks in whatever their environment may be. Maybe it’s athletics, maybe it’s hammocking, maybe it’s outdoors; whatever that is, if you get these pieces, you get a feel for Ozarks, and then you can see yourself using these pieces in whatever fits your personality. Right. And if this connects with you, you might be a right fit student for Ozarks arts. That’s a pretty story of it. Yeah, I think Amy understood after having a conversation with staff from CNP / Echo Delta, after having a conversation, she trusted the narrative that it was a part of a larger narrative. This piece was positioned in this concept for a reason. And it was about the narrative, it was about Ozark as a place and a space, from an academic standpoint, of students coming here, being trailblazers, or leading a new frontier of leaders in Arkansas, but also knowing that we’re greatly connected to the outdoors. Constituents, correct? But then coming full circle so the first group of people that got the admit box, got the box, the freshman class comes in, we let them settle in for about a month, and then I get in front of several groups of them and do focus groups to try to see did we get it right? Did we not? Negative feedback is often more helpful than the positive. “I had two schools, and I got the box and I went to Ozarks.” And I’m like, “Okay.” That’s probably not the norm, but it one, did happen. My next question was, “What was your favorite part of the box?” And 70 percent of the class told me it was the canteen. I said, transparently, it took me two days to relay that back to Reggie. Because it hurt me a little. I was resistant to that, at first, but I trusted the story. And then 70 percent of the students in that class, it was their favorite piece. Yeah, and understand that some of our favorite pieces was the buttons, right? And I think the buttons was my favorite piece, because hipsters wear buttons on their backpacks, plus these buttons connected, and you can elaborate on what those buttons are. But these buttons connected students to physical spaces in the Ozarks. So whether it was Hawk Creek Falls, whether it was Strawberry Bluffs, whether it was Lake Ludwig. So, for us, we wanted students to visit those locations that are a few miles, or 30 minutes, 20 minutes from the institutions, because we know that their student experience is going to be connected to those amazing locations outside our university campus. And then we took it one step further of, “Yes, you came here and you did that, what’s next? It doesn’t stop here, continue to make this your experience without us picking the location.” So once you go to those three locations, the intent was for them to go, and still is, for them to go to the Ozarks outdoor office where is a place where all of our students can rent equipment for free. So, how you connect the enrollment experience to the student experience and the student engagement, and we were very intentional about it. Yeah. I really appreciate that y’all are willing to share kind of the dark side, the uncut kind of reality of what it’s like. Because it can seem easy, it can seem glossy when you see the edited version. One of the things I do want to talk about is the human capital, right? It’s a team that you put together. And how you move beyond what was traditional admissions and marketing, and really re-envision what enrollment marketing can look like, and it’s supposed to look like. So the human capital can be your internal human resource, which is your staff and your team, but also the partners in industry that you decide to collaborate with. Those things are vital and important to the survival of the university; those business partnerships. “This lets the student, this lets the stakeholder interpret the experience for themselves. And you guys want the experience, you want them to interpret their experience for themselves and connect with them?” And we said, “Absolutely.” And we’ve got a lot of positive feedback. But I think it’s so important to say, “Okay, working with C&P, C&P wasn’t just in higher ed in that space, and so it’s being able to say, “Look at Amazon, look at this, and let’s bring it higher ed, let’s do it.” And it wasn’t in higher ed before that, and so I think we can’t get second higher ed, and I think that’s vital. And too often, as business managers, we believe in these loose relationships with our business partners. And here at Ozarks, Amy and I, also President Dunsworth, believes in these close, intimate relationships with people who are going to, not only serve the institution, but also be ambassadors for the institution. Andy McIntyre, Indie Atlantic films, is a great friend of ours, but also gives us advice in terms of the direction, and the creative space that we should be in. Jarrett and Katrina, we have a great relationship with you, and not only are we getting products and services from you, but also we’re getting advice and consultation, and also current trends out there in the market. Because in higher ed, we live in a vacuum and we don’t see outside of higher ed. And so, putting and positioning those companies, or those people around you is very important in the success or failure of an enrollment division. Over time, and to working together to collaborate. And then also having the audacity to allow you and your team to do research and development or not, right? Because yeah have to carve out that small space. Who knows whether it works or not, but allowing you to have and do research and development on an institution is important. The idea that if you look at an Amazon, or Facebook, or a Google, there’s a very cogent argument to be made that the reason those companies are able to be so successful, is because they have all these methods of gathering information in real time, and bringing it into the organization, synthesizing it, and acting on it very quickly. And it’s really about studying the data and absorbing the information, but not being trapped by the data. And finding those creative opportunities to really push your brand. About day to day data. Every enrollment manager I talked to is like, “You gotta love the numbers, you gotta have numbers.” And they’re right, but it’s not … It is necessary, but it’s not sufficient. It’s not the entire story. Kind of reminds me of Steve Jobs, he’s like, “If I just talk to my customers, they don’t know what they want, you have to take a little bit of a creative lead, a little bi of a risk. You have to know who your target audience is, you have to know how to find new audiences, but if you don’t capture their attention, there’s no way you’re going to bring them into your community. And it may be even more detrimental than helping because we’re hitting the audience, but we’re hitting them with poor creative so that they keep scrolling, they don’t even notice. Or they can see bad creative and it can be their first impression of Ozarks, and it can be a negative. Right, creative will get them to stop scrolling and social media is such undervalued attention, but the goal is, is that how do you get that individual to stop scrolling or stop clicking. And that’s what we study, day in, day out; their behavior, and what will get them to stop scrolling and capture their attention. But that is really good advice, and great place to kind of wind down on. Okay, one little parting piece for the folks listening to this, and I’d love to hear from both of you. Someone’s listening to this and says, “Yeah, that’s wow, that sounds great. I’m fired up and ready to do this, but I don’t know if my entire team is going to … It’s going to be a battle. And maybe I don’t have leadership that’s entirely open to this.” What advice do you have for someone sitting in that position, maybe something they could do to, at least, get a step in the right direction? It’s so easy to walk into an environment or in a room and know that you have something that could help. It can help the people around you, it can help the institution overall. Not for self gain, but to help the institution; and there’s resistance to that. And if it becomes a power struggle, if it becomes a forceful school idea, it’s failure. The most valuable thing that we have now is our team. Our developer, Reggie, me, and admission counselors, our data person, our registrar. Our team has the ability to get in a room, throw stuff on a whiteboard, have crucial conversations, have … some of them, I won’t say heated, but they may be … we see different sides of the room. And it’s knowing that you don’t know everything, you can’t operate in silos, and it’s getting in a room and having strategic patients and truly listening, and being open to accepting your colleague’s advice. Because if you walk in with the mindset of, “This is how it needs to be done.” I think you’re setting yourself up for failure. And what Amy is talking about is leading in a moment, and collaborative leadership, and leadership is about influence. And if you can’t influence your team and the individuals around you to act, it’s already failed. So that’s probably strategic patients and figuring out how to lead a team to success is very important to us. Good stuff. Thank you both so much for being here, being so open and sharing all the great stuff and tough stuff that you’ve experienced in an institution. Wish you guys the best of luck for years to come. The Higher Ed Marketing Lab is produced by Echo Delta, a full service marketing firm dedicated to helping higher education institutions drive enrollment, increase yield, and capture donor’s attention. For more information visit echodelta.co. If you enjoyed this episode, please subscribe and leave us a review on iTunes. And as always, if you have questions, suggestions, episode ideas, or just want to reach out and say, “Hi.” Drop us a line at podcast@echodelta.co. See you next time.